Banners.com printed a vinyl banner for the Schaumburg Family Reunion. 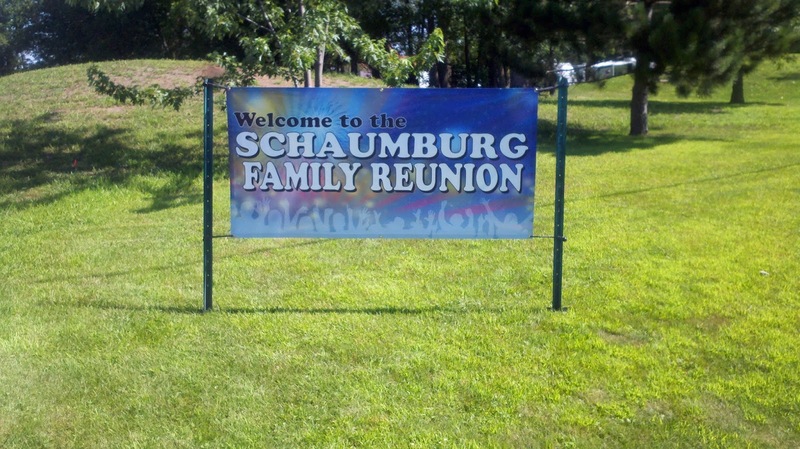 The Schaumburg's have used the banner at the last few family reunions to welcome family to the reunion. The banner was also used as the center of lots of family photos. Thank you so much for helping with the banner design! The colors turned out beautifully. We had lots of compliments from family members. I will be sure to recommend your product! Thank you so much for sharing your photo with us! If you are having a family reunion, visit our family reunion banners page to view templates or upload your own file. We also have graphic designers who can help you with your design. We also have yard signs that you can use to direct people to your family reunion location.